S0737. 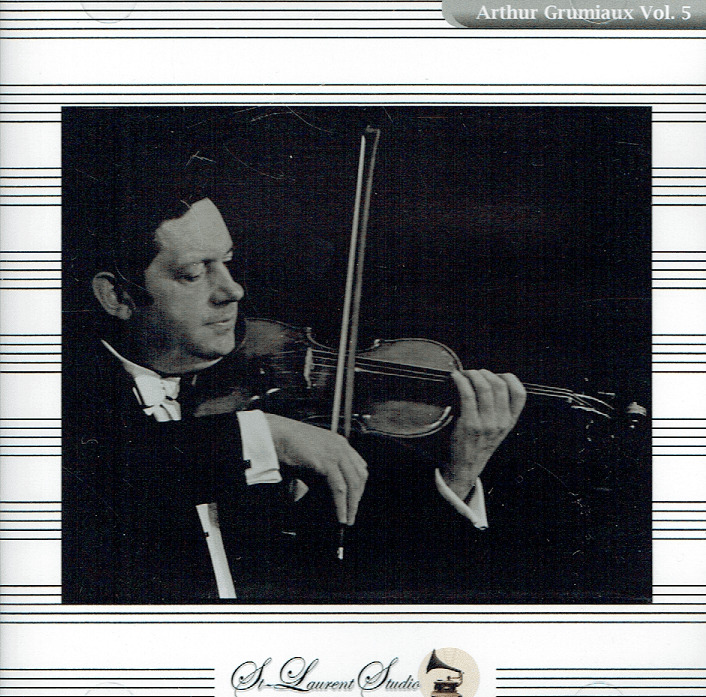 ARTHUR GRUMIAUX: Sonata for Violin Unaccompanied, Op.27, #3 (Ysaye); w. Kubelik Cond. RTF S.O. 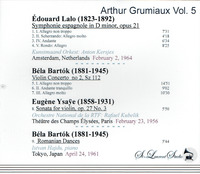 : Violin Concerto (Bartok), Live Performances, 23 Feb., 1956, Paris; w.Istvan Hajdu (Pf. ): Romanian Dances (Bartok), Live Performance, 24 April, 1961, Tokyo; w.Kersjes Cond. Kunstmaand Orch. : Symphonie espagnole (Lalo), Live Performance, 2 Feb., 1964, Amsterdam. [The inimitable highlights of this program are the Ysaye Unaccompanied Sonata and the Bartok Concerto, rendering the rapturous Paris audience in ecstasy!] (Canada) St Laurent Studio YSL T-642. Transfers by Yves St Laurent. He trained on violin and piano with the Fernand Quintet at the Charleroi Conservatory, where he took first prize at the age of 11. The following year he advanced his studies by working with Alfred Dubois at the Royal Conservatory in Brussels, and also worked on counterpoint and fugue with Jean Absil. He received his first few major awards prior to reaching the age of 20; he took the Henri Vieuxtemps and Francois Prume prizes in 1939, and received the Prix de Virtuosi from the Belgian government in 1940. During this time he also studied composition privately in Paris with the famous Romanian violinist Georges Enescu, Menuhin's teacher. His debuts were made in Belgium with the Brussels Philharmonic Orchestra playing the Mendelssohn Concerto, and in Britain with the BBC Symphonic Orchestra in 1945. Due to the German invasion of his homeland, there existed a short time gap between these two important events. During that time he played privately with several small ensembles, while refraining from public performance of any kind. Regardless of this slight delay in the initiation of his international career, once started, it quickly developed. Following his British debut, he advanced into Belgium academia when he was appointed Professor of Violin at the Royal Conservatory, where he had once studied. There he emphasized the importance of phrasing, the quality of sound, and the high technical standards of artistry. One of his greatest joys in life was his partnership with the pianist Clara Haskil. On occasion, the two would switch instruments for a different perspective and relationship. Grumiaux was left with a professional and personal absence when she died from a fall at a train station, en route to a concert with him. In addition to his solo work, he has recorded Mozart quintets with the Grumiaux Ensemble, and various selections with the Grumiaux Trio, comprised of the Hungarian husband & wife duo Georges Janzer (violin) and Eva Czako (cello). His successful performance career led up to royal recognition in 1973 when he was knighted Baron by King Baudouin for his services to music, thus sharing the title with Paganini. Despite a struggle with diabetes, he continued a rigorous schedule of recording and concert performances, primarily in Western Europe, until a sudden stroke in Brussels took his life in 1986 at the age of 65. 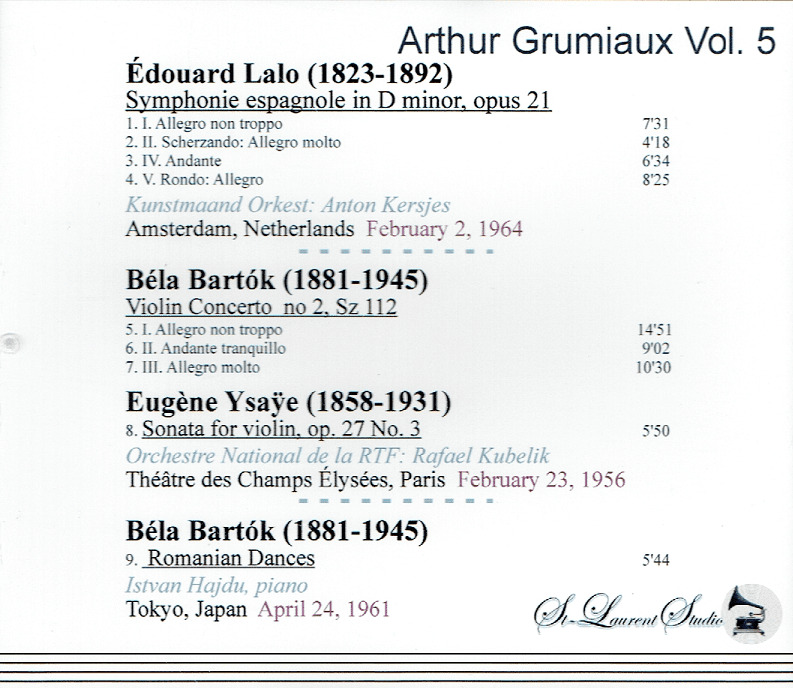 Grumiaux left behind the memory of his elegant and solid musicianship." “Rafael Kubelik, the son of Jan Kubelik, one of the great violinists of the early 20th century, a conductor who was renowned for his eloquent, deeply personalized interpretations and who directed the Bavarian Radio Symphony Orchestra for nearly 20 years after brief, unhappy tenures with the Chicago Symphony Orchestra, the Royal Opera at Covent Garden and the Metropolitan Opera, left his homeland after the Communist takeover in 1948 and lived in London for several years before settling in Switzerland. He became a Swiss citizen in 1973. Mr. Kubelik was a regular guest of the New York Philharmonic until heart disease and severe arthritis forced him to retire from conducting in 1985. His performances were considered highlights of the concert season by those who prized a warm, probing, grandly scaled style of music making that was quickly being eclipsed by a more streamlined, modern approach. He conducted a broad repertory, and championed many modern works during his nearly five decades on the podium. His performances of Czech works, like Smetana's patriotic MA VLAST and the Dvorak symphonies were especially authoritative, and his 1971 recording of the Smetana with the Boston Symphony Orchestra is considered by many to be the best version available. After 1985, Mr. Kubelik conducted only once. Having declared when he left Prague in 1948 that he would not return until the situation changed, he went back in 1990 to conduct MA VLAST at the opening of the first Prague Spring Festival after Vaclav Havel's Velvet Revolution. Mr. Kubelik had conducted the work 45 years earlier to celebrate the liberation of Prague from Nazi occupation. Mr. Kubelik remained in Czechoslovakia during World War II, but later said that as a protest he refused to speak German. He was director of the Brno Opera House from 1939 to 1941, and continued to direct the Czech Philharmonic until 1948, when he left the country. ‘I had lived through one form of bestial tyranny, Nazism’, he told an interviewer about his decision to leave after the Communist takeover. ‘As a matter of principle, I was not going to live through another. I left Czechoslovakia in 1948 vowing that I would never return until Communist rule was driven from my homeland. They have invited me back several times - in 1956 and 1966 - with promises of freedom to do anything I wanted. But so long as that system of government rules anywhere, I refuse to set foot on that soil’. He was appointed music director at Covent Garden in 1955, and led the first London productions of Janacek's JENUFA and Berlioz's LES TROYENS. He gave Joan Sutherland her first major role, in Poulenc's DIALOGUES OF THE CARMELITES. Mr. Kubelik…made many highly regarded recordings, and 1961, after having refused to conduct in Germany for more than 20 years, he accepted the directorship of the Bavarian Radio Symphony Orchestra of Munich, which proved to be his longest and most fruitful relationship. He held that post until 1980, and continued to perform and record with the orchestra until his retirement five years later.